strengthMuscle strength and power that takes place in Beach Soccer, that is, helps you develop both brute force compared with other physical activities or sports. 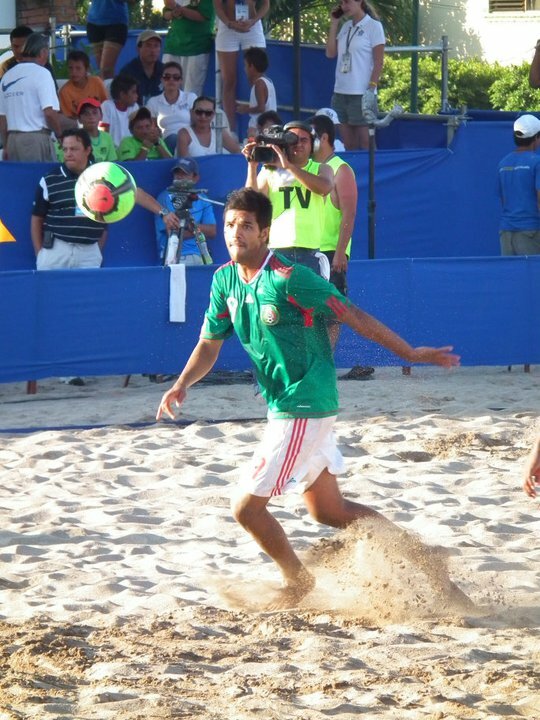 EnduranceCardiovascular endurance constantly providing Beach Soccer practice, that is, how much help you cope ejercitándote long compared to other sports or physical activities. AgilityAbility to move the body as desired quickly and accurately obtained by practicing Beach Soccer, constantly compared to other physical activities or sports. ReflexesAutomatic responsiveness to stimuli is achieved spontaneous Beach Soccer, practice compared to other sport or physical activity. AccuracyHow much will dominate specific body movements to achieve the same result to practice Beach Soccer, compared to other sports or physical activities. 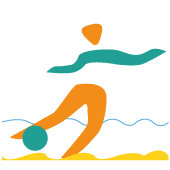 BalanceBoth are able to control the body's muscles to prevent the imbalance by making Beach Soccer unlike other sports or physical activities. ConcentrationThe ability to focus mind and senses intention to achieve a specific goal that is acquired by practicing Beach Soccer, compared to other sports or physical activities. ToningStylization of the body and muscle derarrollo pruduct of optimal levels of body fat that comes from Beach Soccer, compared to other sports. Calorie BurningThat many calories are burned while practicing Beach Soccer, when compared to other sports or physical activities. 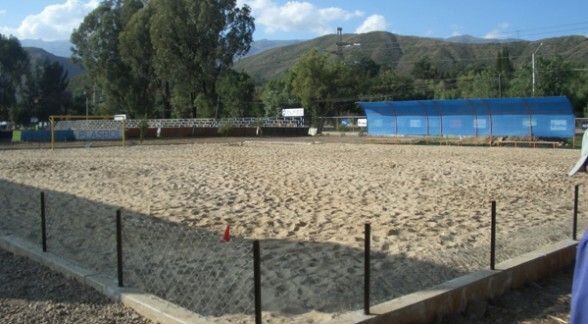 It is played on a smooth sand surface, teams are formed of five players each, the measures of the court are 36 x 27 meters, the goals must be bright fluorescent and measure 5.5 meters wide by 2.2 meters high , the playing time consists of three periods of 12 minutes. Brazil, Leme beach in Rio de Janeiro, in 1992 was created the rules of the game. 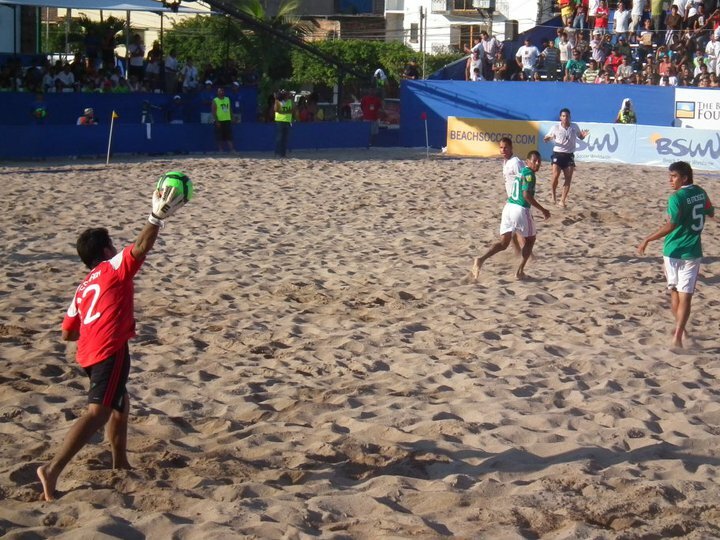 The beach soccer field will consist of a smooth surface of sand, bounded by blue ribbons. Its measurements are 36 x 27 meters, with a variation of + -1 m. The different areas of the field (half of the field, penal areas ...) are drawn by imaginary lines joining two red or yellow flags placed one meter outside the pitch. The goals must be fluorescent yellow, and measure 5.5 meters wide by 2.2 meters high. Each team consists of five players (four plus the goalkeeper) and unlimited substitutions (a bench of additional 3 to 5 players), playing time consists of three periods of 12 minutes. 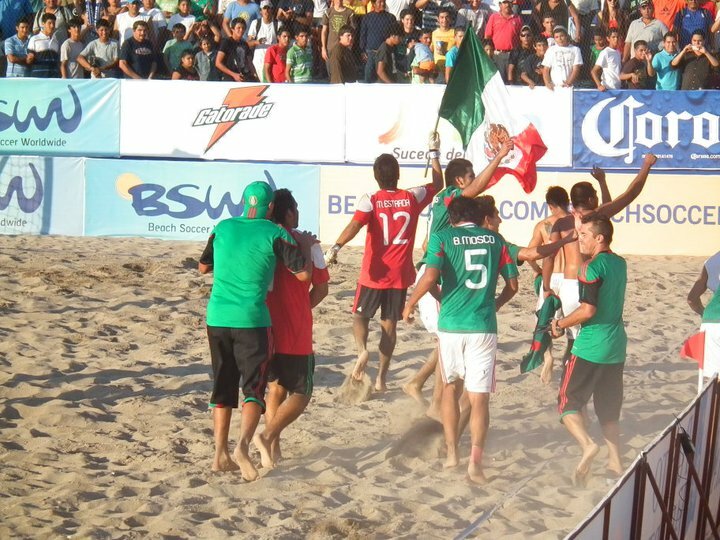 Every beach soccer match must have a winner, playing three-minute extra time in case of a tie, followed by penalties if it ends in a draw. 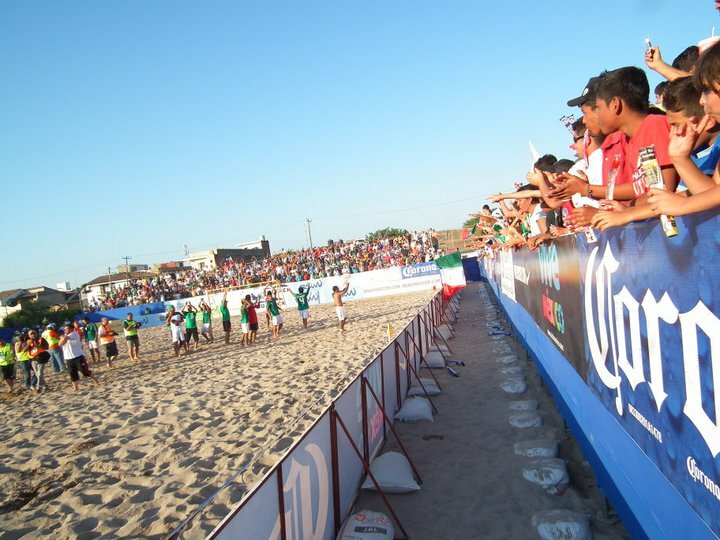 The golden goal rule can be changed according to the various different events such as European Beach Soccer League ESBL. Two umpires control the match. Any misconduct can become direct fault to door, which has to be thrown by the player who was fouled. Blue cards are used to caution the player and mean that the player must leave the pitch for two minutes, during which time his team plays with one player less. Not allow use of footwear, although the ankle supports. Warning yellow card for celebrating a goal by removing the shirt. Differences from conventional soccer. 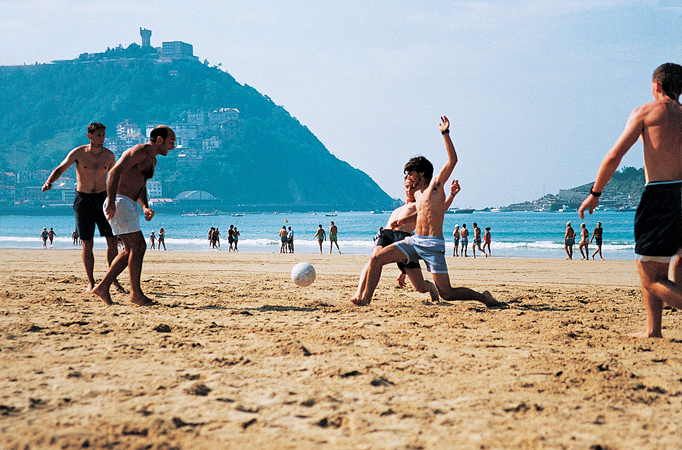 In beach soccer there are three times of twelve minutes. The clock stops when the referee signals a direct free kick, a penalty, or when a player is losing time. All free kicks are direct. When taking a free kick, none of the players, except the goalkeeper, may be placed in the angle between the posts and ball. To them there is no barrier. If a player sees the second yellow card will be shown the blue card, which will result in expulsion for two minutes of the pitch. The red card will show if a player receives a third blue card. Throw-in can be performed with both hands as feet. Launches of penalties are decided with sudden death. Beach Club with sport activities. Did you know... ...in Puerto Vallarta there are no classes of Diving? SporTip ¿Do you have stairs at home or live in an apartment? ¡Take the stairs! up and down the stairs regularly tones the lower legs as well as strengthening the buttocks and legs, just remember that you need to warm up before starting to avoid injury and unnecessary pain.